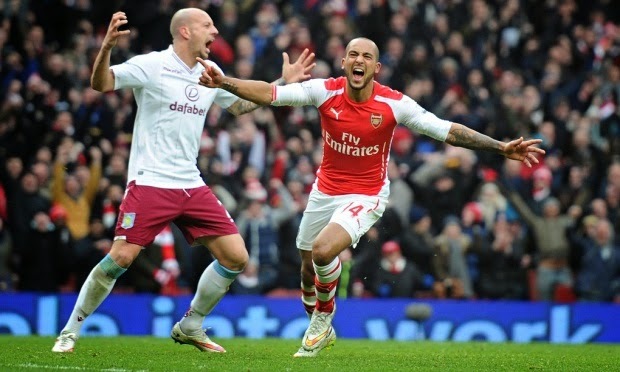 The Modern Gooner: An Arsenal Blog: Arsenal 5-0 Aston Villa: Can We Play You Every Week? Arsenal 5-0 Aston Villa: Can We Play You Every Week? The old saying goes that you can only play who is put in front of you. But, that would be somewhat unfair to an Arsenal side that would have eviscerated more than a few opposing sides on the day. It's true that this death-spiraling Villa side were a concentrated kind of awful, but the Gunners played with verve and precision. In-form players stayed in form, formerly-injured players got match fitness and on the scoresheet...this couldn't have gone any better if we had scripted it ourselves. The Villains were all over the shop from the opening whistle, and were picked apart as early as the second minute. Aaron Ramsey's surgical through-ball had their backline beaten, and if Theo Walcott has the pace of old it would have been 1-0 right there. Jores Okore was able to close him down on that occasion, but the marker was put down. Ramsey just missed with his own attempt a few minutes later, capping off a brilliant team move. But, we'd only have to wait a further 120 seconds for the rout to begin in earnest. Per Mertesacker's punt came to Mesut Ozil, starting his first match in ages. It didn't look like it, though. Somehow, the German managed a back-flick volley directly into the path of Olivier Giroud. I mean, you wouldn't believe that if it happened in a video game. The Villa defense were taken out to such an extent that Giroud was able to finish over the advancing Brad Guzan even after the ball got tangled in his feet. But, that goal was all about Ozil's assist - it made an absolute mockery of the mouth-breathers who question his ability. If Villa were ragged before, they were in tatters by that point. Giroud should have had another soon after, the visitors glad to see him pass instead of shoot from a promising area. One can only imagine how bad it would have been had that went in. They did calm things down enough to hold the ball for short stretches, though Santi Cazorla could have doubled the lead in the 27th minute. He won a header on a punt upfield, Giroud gave it back to him, but the Spaniard could only hit the post. Man, looking back on it, this could have been double digits on another day. They did have one chance to get back into it, but David Ospina was there to deny them. I have to say, I haven't been fully on board with Wojciech Szczesny's demotion, largely on the grounds that I felt like he was the better overall keeper. But, this was the performance I needed to see from the Colombian to be convinced. He was exceptional at claiming crosses and commanding his area, and the save he made here was awesome. A long ball from the sideline came all the way to Andrea Weimann, Per Mertesacker completely static. Hector Bellerin couldn't make it over in time, but Ospina's positioning, anticipation and reflexes were spot on as he got enough of his body in front of the header to get it to safety. It sums everything up about this game that we should have scored directly off the counter from that play. Once again, Ramsey played in Walcott with the Villa defense nowhere, but once again his diminished pace and control let him down. I have to say, at the time I was seriously worried about the kid's ability to recover from the injury and get back to his best. Before that, though, was Villa's one other contribution to the match. Lee Dixon had mentioned on commentary that he had spoken to former Villain Ian Taylor before the match, and their man had said that Christian Benteke just doesn't look interested anymore. He wouldn't have been proven wrong here, having been given half a yard in our penalty area after Weimann's excellent flick. His turn was OK, but the shot was piss-poor and trickled harmlessly wide. Had they scored there, we may have had more of a contest. As it turned out, the floodgates opened for real ten minutes later. Walcott claimed the ball after a loose Kieran Richardson pass, and played it up to Giroud at midfield. The Frenchman isn't normally known for his range of passing, but his through-ball to the onrushing Ozil was exquisite. The German was left in acres of space, no less than four defenders having closed on Giroud. Despite a somewhat tough angle, Ozil simply rolled the ball into the far corner, Guzan helpless as he watched it go. Don't listen to Dixon there, that wasn't saveable. The fight left the visitors from that point on, the remaining half-hour often taking on the appearance of an attack vs. defense training exercise. A few minutes after Ozil's goal, Guzan was picking the ball out of his net again. Ospina found Walcott with a throw-out, and Theo in turn passed to Cazorla. The little Spaniard waited a second to allow Walcott to continue his run, then found him with a heat-seeking missile of a pass. Villa had sent everyone up pressing for a goal, so Theo had the time and space to cut inside and curl a beauty of a shot past Guzan and in. That was the point where the only question remaining was "How bad is this going to get?". Almost by way of answer, Giroud hit the bar with a header immediately thereafter. It helped Villa's cause that we put on Chuba Akpom for the last 20 minutes. I have my doubts about him being anything other than the English translation of "Yaya Sanogo", but if you have to play him, these are the games to do it. He didn't show much in his cameo, but one of his many heavy touches had the knock-on benefit of winning a penalty thanks to a mistimed dive from Guzan. The penalty itself was strange, too. I always say that goalkeepers shouldn't just pick a side and dive, for two reasons: 1) If it's right in a corner, you're not getting there anyway and 2) it's become increasingly prevalent for shooters to dink it down the middle. Cazorla took the kick and did go down the middle, but with more power on it than usual. Guzan held his ground, and probably should have kept it out. It hit his hand at an awkward angle though, and the pace on the shot was enough to get it over the line. Villa were surely praying for the final whistle by now, and it looked like they'd get away with 4-0...mostly due to the continuing struggles of Akpom. However, the Arsenal had one last exclamation point to deliver, and from an unlikely source at that. The Villa defense, strung out in a line two or three yards inside the area, were in damage control mode. Cazorla played a pass across the top of the box to the onrushing Bellerin. The young fullback, who even before this had an exceptional match, took one touch and passed it into the far corner. I mean, are you serious? That was the finish of an elite striker, one that Ozil or Alexis Sanchez would have been proud of. So, hardly opposition worth of the name today, but the simple fact is that Arsenal took care of business on a day where Southampton lost a crucial match to Swansea. More importantly, we go into next weekend's North London Derby in as good a form as I've seen from this team in years. Nacho Monreal and Bellerin are playing out of their minds at the fullback positions. Ospina is proving me wrong as far as who the best keeper at the club is (at least currently - I still think Szczesny has the higher ceiling). Cazorla is simply shredding teams. Ozil and Walcott are shaking off the rust. Giroud is scoring for fun. We have options off the bench, with guys like Tomas Rosicky also in form. Or, in other words, bring it, Tottenham. We're waiting for you. Man of the Match: Well, this one wasn't easy. Almost anyone on the field has at least a bit of an argument, but it probably comes down to one of two guys in the end. Santi Cazorla had yet another performance of astonishing quality, but so did Mesut Ozil - who I'm giving it to because of that ridiculous back-flick volley assist.